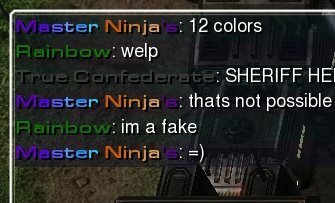 Re: Color Codes for role names and name slots. In case anyone's still interested. Last edited by Phenenas; May 1st, 2014 at 03:13 PM. I recently began playing again and created a color gradient generator (with names). If someone finds a bug, tell me please. here is some, what is the HTML code for colors on the website ? this one has 11 colors. wich is maximum. i mean 12 colors was 2 letters away.... why could u not make this code a bit smaller inside mafia. i mean in css all you need to type is #6000a0 + message like 6000a0Hello. and here it takes soo long time to make a color name with this code and the code makes u not avalible to use more than 11 colors. Last edited by MasterNinja; August 3rd, 2014 at 12:39 AM. Last edited by MasterNinja; August 5th, 2014 at 11:30 PM. Am I missing something? What 11 and 12 colors? The necrotrolling is strong here. This statement is false. Or.. Is it..? Actually, I think it is the following statement that is false. Also, the preceding statement is true. u wot m8? If you aren't mindqf'd enough yet, go and try to solve THIS. but, was patch yesterday. i see people with color names with 2500 points-3000 points? is this possible or else im putting replay up. Last edited by MasterNinja; August 6th, 2014 at 01:46 AM. 11 what? Characters or what? Lol... Idk if I'm being stupid here.. you just said it's 255. Each of red, green and blue can have a value between 0 and 255. That's 255^3 possible colors, no? Idk 11 what you're talking about man. Each letter of his name is a different color. so no one knows if the new patch yesterday limits color names from 2500-3400 points players? You need 5000 points to get colors. -also you don’t really need all those </c>’s, do you? Last edited by fred; August 7th, 2014 at 05:30 AM. Isn't the "j" & "a" in "Ninja" the same color? They look very much alike. I've created a simple html page that makes it easier to create a usable name from the font codes Text Color Fader gives you. It's hosted on codepen and can be reached by clicking here. Try it out! Last edited by Tristan379; October 8th, 2015 at 09:36 PM. Here is an AutoHotkey script that can make your life a little easier in terms of making a colored name. Get AutoHotkey, create new script, and copy this. Run it and then uou simply choose the 2 colors you want and press "F5" - it will type the color code for you. 99% of it is googled things put together. So idk about the comments. Can someone help me fix that macro? For example: 12,40,55-176,229,12 shows up as C2837-B0E50C. <c val="12,40,55-176,229,1"> Works, while <c val="C2837-B0E50C">shows up as pure white. I know that C2837 should be 0C2837. C2827 IS pure white, less, than 6 symbols in hex code = white. But i tried 0C2837, same effect, report to blizzard, don't worry. Colored Names explained? Where has it gone?